Dozens of Daesh Takfiri terrorists and their families have been cornered in a small area in Syria’s southwestern province of Dara’a after losing all other territory they once held in the region to advancing Syrian government troops, a monitor says. “There have been talks since yesterday” between government forces and the trapped Daesh terrorists “to evacuate around 100” terrorists “and their families from the southwest part of Dara’a to the Badiya,” said Rami Abdel-Rahman, the head of the so-called Syrian Observatory for Human Rights, in a report published on Tuesday. Badiya refers to the vast desert stretching from central parts of the Arab country to its eastern border with Iraq, and where Daesh terrorists still holds some small and isolated territory. Abdel-Rahman added that in an attempt to secure their way out of the besieged pocket, terrorists had already offered to release 30 Druze women and children the terror group kidnapped on Wednesday as a bargaining chip. “In exchange,” Daesh “would release 30 hostages it took from Suwayda last week,” he further said, adding that Russian fighter jets had conducted some airstrikes on the area earlier on Tuesday “to put pressure” on the terror group. On July 15, Daesh terrorists, who lost all of their urban bastions in the Arab country late last year, launched a brutal attack on the rural areas of the province, killing more than 250 people, who were members of the Druze minority. They also abducted 36 women and children during the raid. Four of the abductees managed to escape from the grips of terrorists, but two of them lost their lives, the UK-based monitor reported on Monday. Furthermore, it said that another 17 men from the attacked areas were still unaccounted for, but added that it was unclear whether they had also been abducted. Some reports say that the abductees were all from the village of al-Shabki, in the eastern hinterlands of the province. Suwayda, which is largely under the control of the Syrian government troops, is home to the Druze minority. The province has been relatively insulated from Syria’s seven-year bloody war launched by foreign-backed militants and terror group against Damascus. Last week’s attacks were the bloodiest ever seen in the province, as well as some of the deadliest launched by Daesh in the war-torn country. 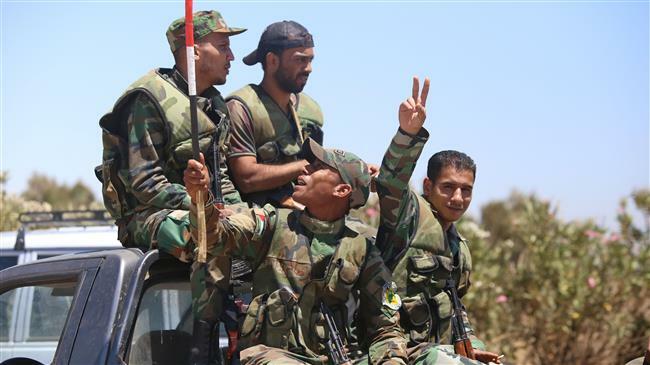 During the past few weeks, the Syrian army troops were quick in shrinking areas held by Daesh in Dara’a and neighboring Quneitra province. Now, Daesh terrorists are mainly trapped in a small pocket of land along the border with Jordan. Syrian state news agency, SANA, reported on Monday that it expected that the terror group would collapse “within days” in the area.